The Glades trail is located in the Sunlight Mountain Resort Nordic Area near Glenwood Springs, Colorado. The trail begins near the lower end of the Babbish trail not far from the Sunlight Cross Country Ski cabin. From there the trail makes a moderate climb up the forested mountain side until it comes to an end near the junction of the Little Beaver and Ute Connection trails. To get to the Glades trail find your way to where the Babbish, Williams and Old Four Mile trails all converge across from the Sunlight Cross Country Ski cabin and start heading up the Babbish trail. 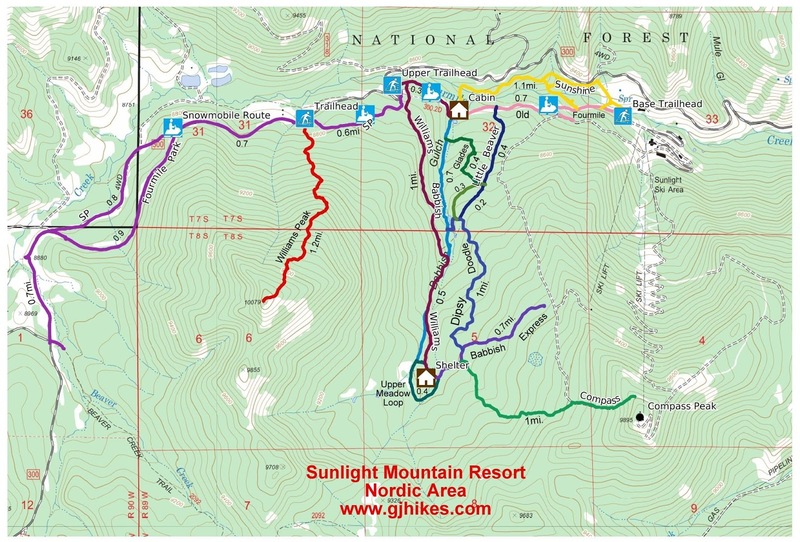 For a good route from the Base trailhead at Sunlight Mountain Resort follow the directions for the Old Four Mile trail. From the Upper trailhead follow the Williams trail down the Old Four Mile Road for just over a quarter mile. 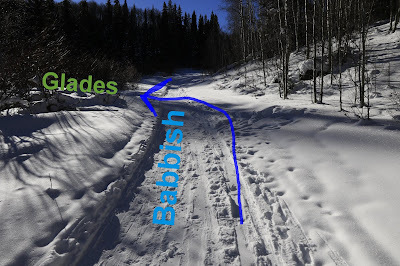 After heading up the Babbish trail for about 500 feet the Glades trail begins on the left. There wasn't a sign marking the Glades trail when we took the photos for this post but the trail is obvious none the less. The first part of the Glades trail follows a road that leads up to a pond and a big mound of rich looking dirt that looks like a compost pile. After briefly leveling off the trail turns and begins climbing once more up the bank on the left side of the pond. As the trail reaches the level of the pond it continues climbing up a knob. There is an option down at the pond level to take a route that isn't quite as steep that goes around the right side of the hill. After that climb the trail levels off and even makes a short dip. As the trail finishes up it turns into a peaceful glide through the trees. The Glades trail comes to an end at a groomed trail that stretches between the Ute downhill ski run and the Dipsy Doodle trail. The ungroomed portion of the Little Beaver trail crosses the groomed trail about 100 feet to the left from this point. The Glades trail is a nice option for getting up the mountain that doesn't get nearly as much use as the neighboring groomed routes. If you would like to see it for yourself then all you have to do is 'Take a hike'.